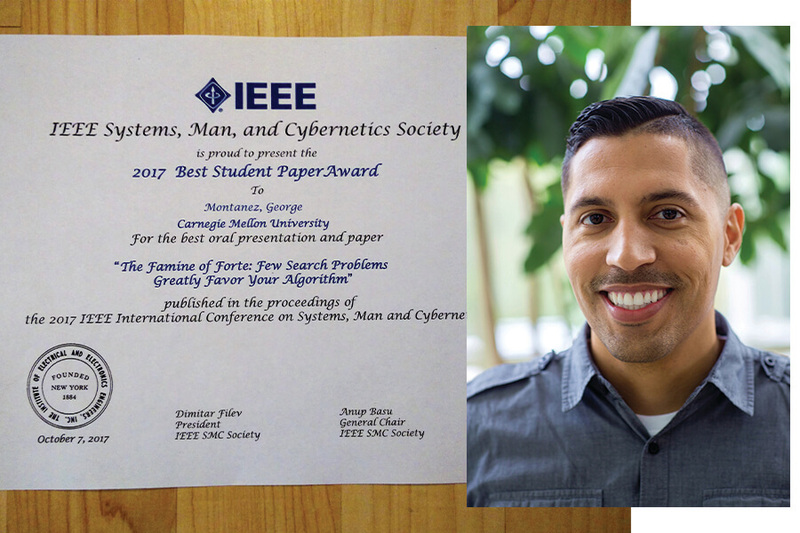 Congratulations to George Montañez, Machine Learning PhD alumnus, on winning the Best Student Paper Award at the 2017 IEEE International Conference on Systems, Man, and Cybernetics. Montañez's paper, "The Famine of Forte: Few Search Problems Greatly Favor Your Algorithm", was chosen from over 1,200 submitted papers. The IEEE International Conference on Systems, Man, and Cybernetics is the flagship conference of the IEEE Systems, Man, and Cybernetics Society. It provides an international forum for researchers and practitioners to report up-to-the-minute innovations and developments, summarize state-of-the-art, and exchange ideas and advances in all aspects of systems science and engineering, human machine systems, and cybernetics.